The effects of information and communication technologies (ICT) within the travel and tourism sectors are far-reaching. ICT has proven to have positive and negative consequences for the demand and the supply side. Travelers can access various information sources to get “the real” picture of offers while there is the challenge of information overload and compromised privacy due to digital footprints. The supply side can tap into a great variety of digital communication modes allowing them to be more creative with regards to information provision. However, it appears to be a challenge to keep pace with available opportunities such as the selection of relevant sales channels, consumer engagement, exploitation of new (big) data analytics, new data formats, and increased transparency in general. From a research point of view, those developments push academics to be creative and innovative in terms of identifying knowledge gaps, accessing data sources, integrating new data formats and to combine different sources and formats in order to get more reliable and precise insights. Insights in these areas contribute to the understanding of trends and the continuous development of strategies and tactics to promote organizations and to create knowledge. The papers selected for this special section focus on the usage and combination of digital data sources and data formats in order to improve prediction accuracy, information presentation and user engagement. 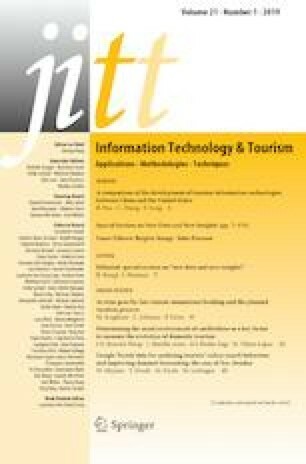 The presented papers are extended versions of contributions presented at ENTER2018, Information and Communication Technologies in Tourism Conference, which took place in Jönköping, Sweden, on January 24–26, 2018. The collection of six articles in this special section provides interesting insights and thought-provoking approaches and methods in terms of using and combining available data to gain new or refined knowledge about travelers’ behavior. Scaglione, Johnson, and Favre use transaction data from the largest self-catering accommodation booking platform in the Romand Valais in Switzerland to analyze last-minute booking behavior for self-catering customers. They analyze the optimal moment for launching last minute deals. Results show that the timing can be optimized when the travel party composition is considered. Palop, Arias, Sagi, and Lapaz utilize digital sources, namely credit card data (i.e. card transactions and cash withdrawals), to provide an innovative way to enhance vision on domestic tourism dynamics. They use this data to delineate the usual environment of people and to classify transactions as touristic or non-touristic. Findings show that transactional data is useful and that only minor amendments are required in order to implement the approach for different regions. Höpken, Eberle, Fuchs, and Lexhagen propose a novel approach to tourism forecasting by combining arrival data and Google web search data to forecast tourism demand in Åre, Sweden. The analysis of the relationship between tourist arrivals and search terms provides insights into planning behavior. Their approach outperforms traditional autoregressive approaches and increases the predictive power in forecasting tourism demand. Lalicic, Huertas, Moreno, and Jabreel investigate the communication of destination brands through social media using thousands of tweets and posts from Twitter and Facebook. They show what kind of emotional brand values destinations communicate in social media and how users respond to different brand values presented in social media. Their approach assists destinations in their online marketing efforts by improving user reaction rates and by facilitating a positive brand image. Iinuma, Nanba and Takezawa propose a method for generating a summary of multiple travel blog entries that contain not only text but also images. They introduce a tool and conduct two experiments to investigate the quality of the summaries and the effectiveness of the method. The experiments show that the proposed method can outperform state-of-the-art baseline methods with regards to both quality and effectiveness. Finally, Sertkan, Neidhardt and Werthner introduce a way to use the Seven-Factor Model of tourism destination personality automatically to enable matchmaking for recommender systems. They present a methodology to map destinations onto the Seven-Factors, and examine the relationship between destination attributes and the Seven-Factors. The suggested approach contributes to the development of recommender systems supporting travelers to find the right services. We are grateful for all the authors who have contributed their research to this special section, and to all the reviewers who helped to provide feedback to further improve the articles.